In one of the most powerful films/documentaries at Cinequest, highly acclaimed Circles tells the story of Eric Butler, a hurricane Katrina survivor who teaches restorative justice in Oakland. Butler’s job at a local high school in Oakland is classified as a ‘last chance school’. These kids have been suspended, expelled, and flunked out of their previous high schools. Some of them have had the toughest of lives growing up in an impoverished area, with family members involved in everything from gang activity to prostitution. Butler’s program of reformative justice seeks to help these young adults in the only way he knows how, to be honest and straight up with these young men and women, while providing a figure they mostly don’t have in their lives, a supportive one. Butler and his son Tre moved to Oakland right after Hurricane Katrina while Butler’s daughter and ex have remained in New Orleans. The documentary shifts midway through the film as Tre finds himself in trouble with the law. Like many of the students in Butler’s school, he finds himself in the wrong crowd and on the wrong side of the law. Butler has to keep his focus on his son while also giving as much as he can to his students who need him more than anything. On top of everything Butler is dealing with, he also realizes that financially he and Tre may need to move out of Oakland and contemplates taking a similar job in Texas. One of the most compelling documentaries and films at Cinequest, you are immediately taken with Butler and the work he is doing with at risk youth. When the filmmakers shift the story to include more of Butler’s personal story (in a Q&A the director admitted the narrative changed unexpectedly), it is a seamless transition as your heart breaks even more for the Butler family. While its easy for society to dismiss Tre as just another juvenile on the wrong path, what is worth examining is the steps taken to help correct that course. There is simply not enough reformative justice throughout the United States; there are simply not enough Eric Butlers in the world doing this type of work. As a special treat on the final Saturday afternoon showing of Circles at Cinequest at the Hammer Theatre, Butler was present and was presented with a special Cinequest visionary award. He received an extended standing ovation. 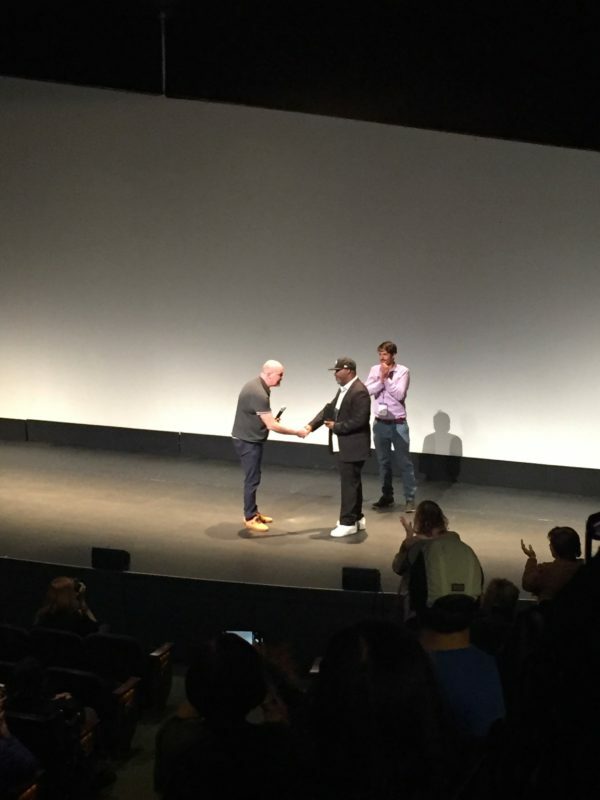 Eric Butler receiving a special Cinequest Visionary award on Saturday, March 16th 2019. Circles has had several special film screenings and is definitely worth it to seek out as you will truly be awe inspired by the power of documentary filmmaking. More information on the film can be found at : https://www.circlesmovie.com.